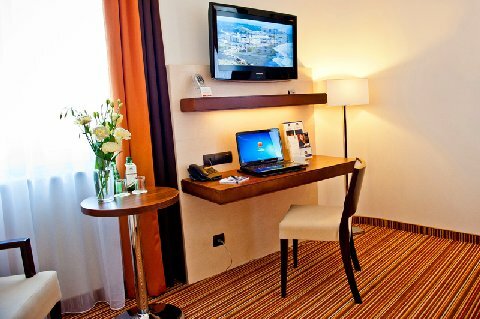 Located in the center of Rzeszów, Hotel Best Western Ferdinand offers guests a high standard of service for a great price. The hotel is located close to the railway station, railway station and bus station, taxi rank, bus stop. Guests can bring even the most modest luggage, because everything you need is on site. The rooms have been designed with this in mind to ensure the best conditions for comfortable work and rest. In the immediate vicinity guests will find restaurants, clubs, shopping centers, cinemas, theaters, galleries and museums. Within 5 minutes guests can walk to the market Rzeszow. The hotel offers 39 single and double rooms, a total of 70 beds. Guests will find a comfortable and functional rooms with individually controlled air conditioning and free wireless internet (WiFi). The rooms are large safe where you can store your laptop. You can always make yourself a hot drink in the room with a kettle and cups. Guests have plenty of spacious bathroom with shower, towels and hair dryer. Guests can enjoy a delicious Polish cuisine in the restaurant Qchnia28, which is located on level -1. In a warm and stylish interior guests will enjoy delicious and exquisitely presented food. The extensive menu and the dishes will satisfy even the most demanding palate. The restaurant also serves vegetarian dishes. The restaurant is open from Monday to Friday 12:00-23:00 and pamper your company lunch, family dinner, an intimate dinner or organize a party. On the ground floor there is a Coffee Bar "Belluno". Guests can enjoy a real Italian coffee, and taste delicious snacks, cakes, ice cream and drinks. The specialty of the bar is a delicious Italian pasta and sauces are created from original Italian recipes. The hotel is located in the very center of Rzeszow.